Joe: 2013 has been an interesting year for WWE in terms of DVD and Blu-ray releases. If you think back to the past two or three years, there was usually a consensus title for what would be the DVD of the Year. In 2012, I was hard-pressed to find anyone who didn’t think CM Punk: Best in the World was, in fact, the best in the world (for that year, at least). Back in 2011, we had both Stone Cold Steve Austin: The Bottom Line… and The True Story of WrestleMania as the two clear top picks. And back in 2010, Chris Jericho’s first 3-disc DVD was the popular choice for the best DVD. This year, though, I’ve seen many different opinions on the top DVD of the year. At the same time, though, we haven’t really had any major disappointments, another rarity. Thus, we here at WrestlingDVDNews.com are going to look back at the year as we saw it, and pick out our own surprises, minor disappointments, and favorite releases of the year. If you are curious for detailed thoughts on this year’s releases, feel free to go back to the review archives. Instead, we’re going to look at the big picture of the year in DVDs. Joe: I’ll start briefly with the negativity before we start to talk about what we loved. In my opinion, we didn’t have any major disappointments this year. Sure, the match quality on Best of WCW Monday Nitro Vol. 2 isn’t great, but I still had fun revisiting these old, occasionally silly matches. Best of WWE at Madison Square Garden was probably the least interesting release we had this year, but there still were some solid matches featured on the DVD (even if a lot of them were repeats). Plus, we got some involvement from Bruno Sammartino, which was cool to see. The only Blu-ray that I didn’t really enjoy personally was Goldberg: The Ultimate Collection, but that’s because I’m not a big fan of Goldberg, and don’t have much nostalgia for his WCW run. If you were a fan of Goldberg in the past, I’m sure you had fun revisiting his old matches. Short of involving the man himself, that was pretty much the best Goldberg DVD we could possibly get. Joe: That all being said, this really was a pretty banner year for WWE DVDs. Mark D called it the best year since 2009, and I would agree that it’s one of the best we’ve seen in a while. One clear trend I’ve noticed from the WWE is an attempt to move away from including too many repeats on any particular DVDs. Sure, there are always going to be some classic matches that are released multiple times, but it’s become clear to me that each DVD includes a few unreleased, hidden gems in addition to these classic matches. We’ve even gotten a few DVDs that are catered towards unreleased footage, like Bret Hart: The Dungeon Collection and ECW Unreleased Vol. 2. I think we’ll continue to see releases that are focused on unreleased footage in addition to the usual match compilations. Aaron: The titles that initially jump out at me this year were the individual WrestleMania releases and the RAW 20th Anniversary set. For collectors like myself, I was stoked to pick these DVDs up because they are incredibly unique in content and packaging. We haven’t seen releases this unique in packaging and content since the Anthology sets for the Big 4 PPVs. I hope WWE continues the trend of releasing individual DVDs for Summerslam, Royal Rumble, and Survivor Series in the future. Joe: I would agree with Aaron that one of the most interesting releases of the year was the Raw 20th Anniversary Collection box set. For long-time fans, this was a must-own. I think the WWE made the right call by making this a limited-time-only release. The diehards are going to pick this up, and they are willing to pay the elevated price for a big set. I hope we continue to see DVDs like this released in the future; it seems the Raw box set was at least a modest success for them. Mark: 2013 wasn’t a great year for documentaries; in fact, we were only given four of these sets (Triple H, History of WWE, Mick Foley and 25 Rivalries). Of theser I would have to say my favourite would be Triple H, but who doesn’t have a soft spot for the Micker too? Joe: I am a little more positive on the state of documentaries this year, but I would agree that we didn’t have any classics this year. I found the History of WWE documentary to be very well put-together, but I’m not going to pretend it gave us many new insights into the history of the company. For what it was, I think an argument can be made that Top 25 Rivalries was the most surprising documentary of the year; this was much, much better than it has any right to be. My disappointments with the Triple H doc are pretty well documented, so if I had to pick one favorite doc this year, it would probably be Foley’s. In fact, I think the Foley release could have been one of my favorites of the year if the bonus matches weren’t so poorly chosen. The bonus matches on the Foley set were probably my least favorite aspect of any DVD/Blu-ray all year. Aaron: In addition, Triple H and Mick Foley were given proper documentary pieces that should be placed towards the top of everybody’s “Best Documentaries Released” list. Mark: 2013 has been a really great year of WWE DVD releases (possibly the best year since 2009), as a result it’s really tough to narrow it down to just one favourite DVD. However after some deliberation I would have to go with Legends of Mid-South Wrestling. This set was really awesome. Initially, I won’t lie I was really disappointed that it wasn’t going to feature a documentary. However WWE did a fantastic job of telling the “story” of Mid-South without one, they managed to highlight many if the stars, memorable feuds and classic matches of the promotion and the set tells it’s own flowing story, it really isn’t a random collection of matches. Mark: In regard to other releases, two of my personal highlights of 2013 were Bret Hart: Dungeon Collection and ECW Unreleased Vol. 2. (Now I’m going to try and write this without sounding like an ego maniac) this is because it’s very difficult not to spot the correlation between these finished sets and the Fantasy Concepts which were created a year prior to the actual releases. In fact if you look closely ECW Unreleased Vol. 2 features around 15 matches which were included on the fantasy concept version (even down to Doink vs. 911 as a Blu-ray extra). As a result those sets will always have a special place in my heart. Aaron: 2013 has proved to be another highly successful year for WWE DVDs and Blu-rays. In my opinion, 2012 provided fans and collectors with one of the best years for DVDs in history. I was highly skeptical that 2013 would reach the same level as the prior year but I was pleasantly surprised with the unique quality this year has produced. 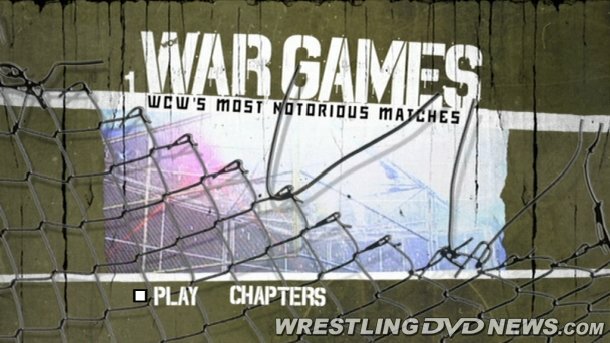 Fans were treated to some great match compilations like War Games, Best of In Your House, and Legends of Mid-South throughout the year as well. These discs will be rotating in and out of my Blu-ray player frequently, I can assure you. It was also very promising and exciting to see second installments of ECW Unreleased and the Best of Nitro sets. Although it hasn’t been announced yet, I wouldn’t be surprised to see those series of DVDs continue into 2014. Aaron: Visually speaking, nearly every cover art this year was good to great. Although we saw a fair share of spoilers on the covers of PPVs, I am satisfied with the artwork and color scheme for nearly every release this year. Breaking it down, it is clear that this was a great year in wrestling DVDs. Thank you for the continued support of WrestlingDVDNews.com throughout the year and if you don’t agree with my assessment, I’ve got two words for ya…comment below! Joe: As I mentioned earlier, this year was all about match compilations for me, and they top my list of the best DVDs this year. I am thrilled to have a War Games Blu-ray in my collection. Even if the matches get a bit repetitive, this is an awesome piece of wrestling history. For me, the top two Blu-rays come down to the two that Mark and Aaron chose as their favorite releases. Best of In Your House has very strong match quality throughout, and the WWE did an excellent job balancing classic repeats with unreleased matches. As great as these matches are, though, I still think I would give the slight edge to Legends of Mid-South Wrestling as my DVD/Blu-ray of the year. The segments throughout function as a nice documentary, and for classic footage, I was surprised how well the matches hold up to today’s audience. In my review, I called Mid-South the “ROH of its time”, and I stand by that. The matches were very ahead of their time, and I had a blast watching them. I hope we see more matches with classic footage like this released in the years to come. In all seriousness, the DVDs that stood out to me were Bret Hart: Dungeon Collection, Mick Foley: For All Mankind, Triple H: Thy Kingdom Come, Legends of Mid-South Wrestling, History of WWE, and Raw 20th Anniversary Collection. Documentaries are what I look to first and they were all very good – though I will say the Foley one felt a tad unnecessary and the Triple H one had its disappointments. History of WWE won’t be called groundbreaking but it is a lot of fun. I think the uniqueness of the “RAW20” box set stands above all titles this year and personally feel a large compilation of full Raw episodes is something the collectors were longing for over the years, I know I was. The Blu-ray cancellation was a big disappointment actually but that still doesn’t dethrone it for me. In terms of reporting the news this year, I’d say the most fun I’ve had doing so goes to that 12-disc box set and the Triple H DVD. Both had lots of hype, both were a long time coming. Happy New Year everyone! 🙂 Vote in our year-end poll before January 4th. Very nice article, thank you guys for the reviews/fantasy concepts/articles/etc!! Great bit of writing guys! I’ve been a bit behind on my WWE BR/DVDs, but did get the Foley and Attitude Era BRs, and the Annual 2013 and Greatest Superstars of 21st Century on DVD for Christmas. Alot of good viewing there.